Banking bot help customers to see banking services and open a new account quicker and easier. Define and manage your dynamic data easily. Chatbots in the banking sector can bring a huge change in customer experience. 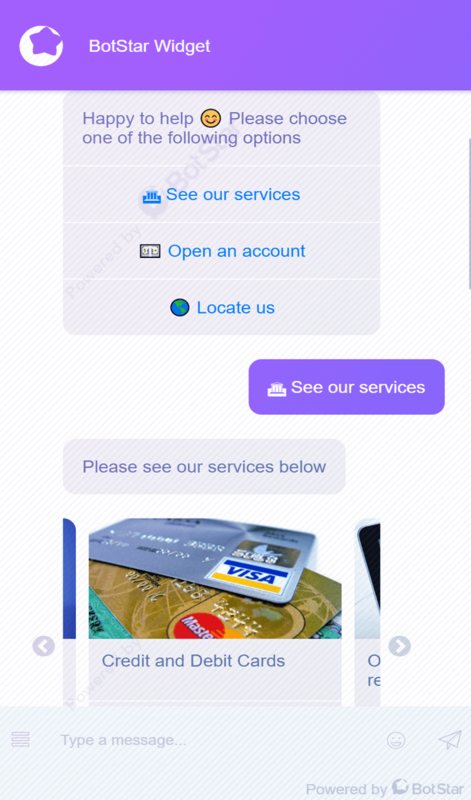 This Banking chatbot template will support customers to see banking services (Transaction Banking, Credit and Debit Cards, Foreign exchange, Margin trading facilities, Online banking and reporting), help them to open an account and navigate to a location for customers. 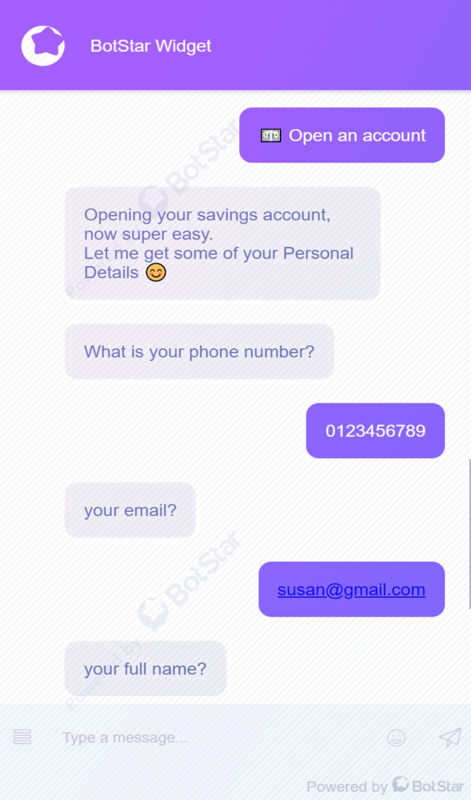 Banking chatbot template will prompt new customers to open bank accounts and purchase financial products. This template is an official template built by the BotStar team. It’s free-to-use and we are not bound to provide support for this item. 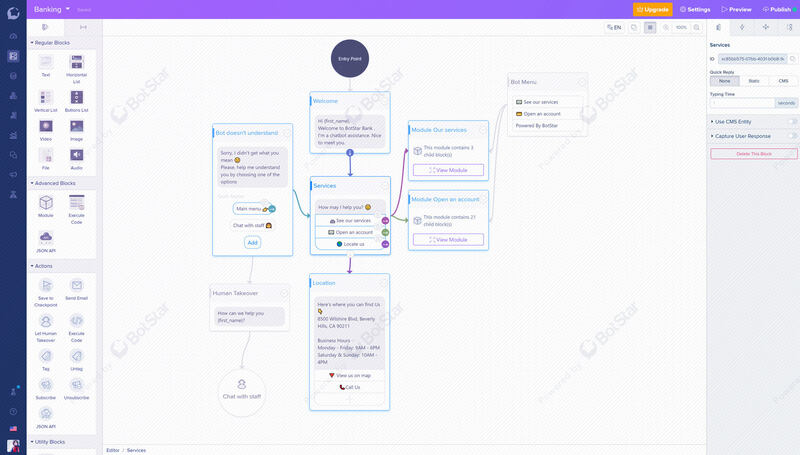 If you think this chatbot template is awesome or have any feedback, feel free to leave comments or questions below. How easy to customise this template? All it takes is a few minutes or a few seconds if you are familiar with BotStar already. Our platform is that easy to use! Once you purchase, a new chatbot will be cloned from this template. Once inside the app, you can click on “Preview” to test the bot internally or click on “Publish” to connect your Facebook page or Website before publishing your chatbot within minutes. Do I need the PRO Plan to use any template? Some templates might requires PRO Plan in order to utilise the number of tags, training keywords, attributes or sequences in the initial design of the template. The more complex a template is, the more likely it will require PRO Plan. Our Starter Plan is free but comes with some limitations on the numbers of Tags, CMS Items, Total Subscribers and unremovable BotStar Brand. Please view our pricing here for more details. How do I get support for this template? Support for free templates are provided at the author’s discretion. Support for premium templates are provided through email via email address provided by the author. If you find any bugs with this template, feel free to ask questions on our community forum or leave comments here on this page. How can I change the language of a chatbot template? The platform will ask you the primary language of your bot. You can also edit the example content provided in the template to your own language. BotStar also does support multi-lingual bot. You can add another language by browsing to “Settings/General/Secondary Languages”. There are toggles to switch between languages throughout our platform should you need to edit bot contents.